Russian President Vladimir Putin issued a chilling warning about the rising threat of a nuclear war, saying “it could lead to the destruction of civilisation as a whole and maybe even our planet” — and putting the blame squarely on the US. Speaking at his annual news conference, Mr Putin scoffed at Western claims he wants to dominate the world and said Western countries are antagonising Russia for their own domestic reasons, and at their own peril. He dismissed claims of Russian interference abroad, from a nerve agent poisoning in Britain to an alleged effort to infiltrate the US National Rifle Association. Instead he sought to paint himself as the world’s protector. 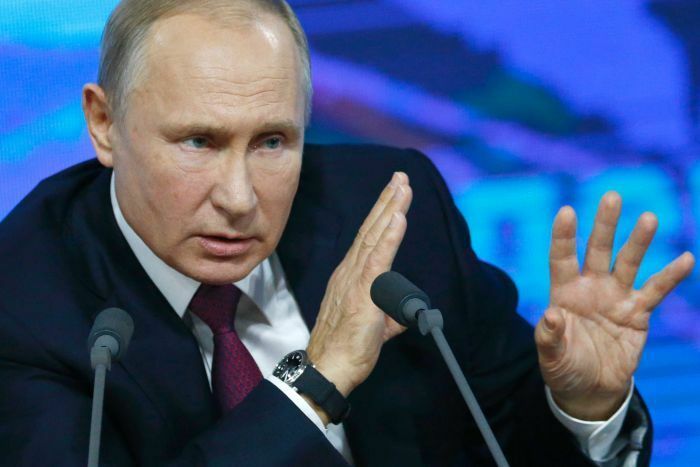 Pointing at the US intention to withdraw from the 1987 Intermediate-Range Nuclear Forces, or INF, Treaty, Mr Putin warned that if the US puts intermediate-range missiles in Europe, Russia will be forced to take countermeasures. “We are witnessing the breakup of the arms control system,” Mr Putin said, noting the US plan to opt out of the INF Treaty and its reluctance to negotiate the extension of the New START agreement. US officials say the withdrawal from the INF was prompted by Russian violations of the treaty. Mr Putin noted that Western analysts are talking about the possibility of using low-yield nuclear weapons. “There is a trend of lowering the threshold [of using nuclear weapons],” Mr Putin said. “Lowering the threshold could lead to a global nuclear catastrophe. “We will have to ensure our security. Mr Putin also emphasized that the US is pondering the use of ballistic missiles with conventional warheads, saying that the launch of such a missile could be mistaken for the launch of a nuclear-tipped one and trigger a global catastrophe. “If that happens, it could lead to the destruction of civilization as a whole and maybe even our planet,” he said. Mr Putin also noted that the US appears to show little interest in extending the New START nuclear arms reduction treaty, which expires in 2021. Mr Putin said it’s the US, not Russia, that’s aspiring to dominate the world. He pointed at US annual defence spending exceeding $980 billion, comparing it with Russia’s military budget of $64 billion. The US “has done the right thing,” Mr Putin said, reaffirming the long-held Russian argument that the US presence in Syria was illegitimate because it wasn’t vetted by the UN Security Council or approved by Syrian President Bashar Assad’s government. The pull-out is also likely to strengthen Russia’s role in Syria’s future.